Greetings, Ten Feet Off Beale readers! I'm so excited that Alyssa invited me over to hang out today. As a soon-to-be-bride, Alyssa told me she's thinking about "first look" photos with Jeremy on their wedding day! 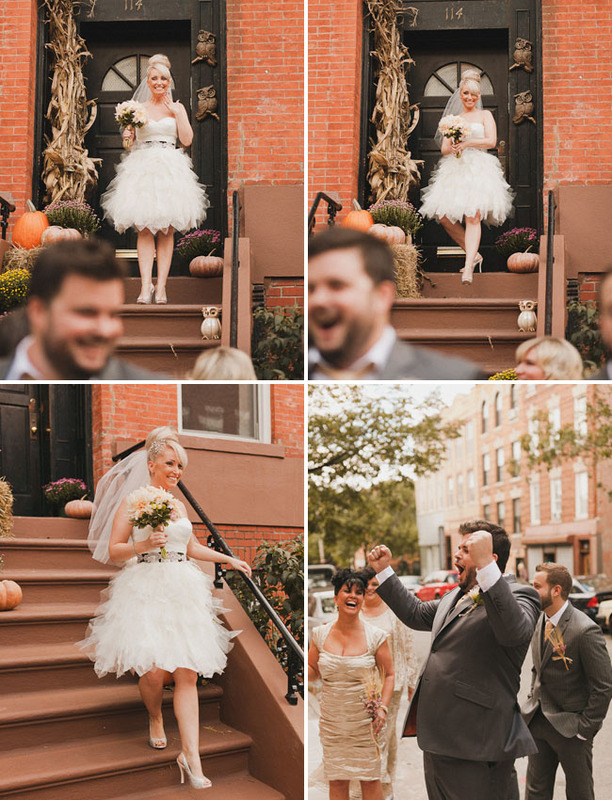 I adore first looks but not everyone knows what they are, so I wanted to share what a first look is all about, why you should do one, and some of my favorite first look images. Here's the thing about having first look photos: you have a moment to yourselves, instead of in front of your entire congregation of wedding guests, to see each other for the first time on your wedding day. As a wedding photographer, I really love first look photos because it lets up on some of that pressure to take a ton of portrait photos in the crunch-time that happens post-ceremony. This also means you get to your reception (and start to party down) a lot sooner! Here's a quickie list of awesome reasons for doing first look photos (and many thanks to The Things We Would Blog for helping me with this list). 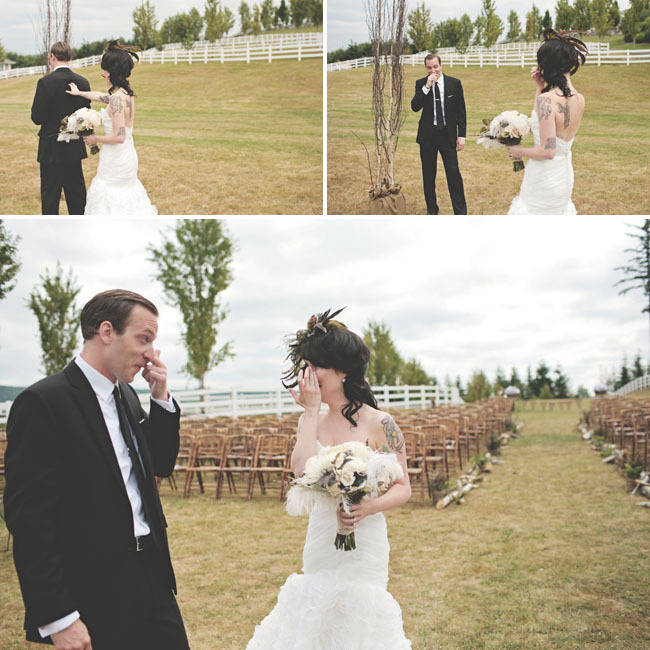 You'll still have the impact of seeing each other for the first time on your wedding day, but it's a bit more private. You might be worried about losing the "wow" factor of seeing each other for the first time as the bride walks down the aisle, but you're still about to get married. The moment is EPIC. The two of you can have that moment in private and really enjoy it together. A bride I'm working with for her September wedding said that, despite the tradition of waiting until the ceremony to see each other, she'd rather do some first look photos; she knows she'll feel anxious and excited, and thus might feel awkward once she gets to the altar to marry her groom, because she'll want to chat with him in the excitement of the moment. You can't really do that with your guest list looking on as the ceremony begins, but you can do it with first look photos! You'll get to your reception faster (as I mentioned earlier), and as a result, you'll feel less rushed and less stressed. The number of photos you have to take during the cocktail hour will drop significantly if you can take bridal party and bride-and-groom portraits before the ceremony instead of trying to squeeze them in with all your post-ceremony, pre-reception family photos. This is a somewhat lesser reason (in my opinion) in terms of the overall unfolding of the day, but your hair and makeup look fresher if you do portraits with your man before the ceremony instead of after! 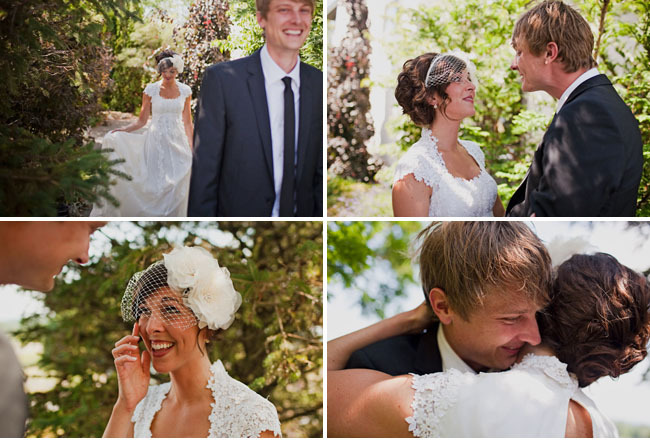 Here are some of my favorite first look images; my truly ultimate favorites are the ones with tears involved (I LOVE an emotional groom!). I was also recently introduced to the concept of a father-daughter first look, which I recently shared on my blog -- so sweet! And, if you still really, really want to wait for the ceremony to see each other for the first time, you can still take first look photos. There is no shortage of cute ideas for taking photographs together without actually seeing each other. What is your take on first look photos? Did any of you take first look pictures when you got married? What are your thoughts?? We are definitely doing pre-ceremony photos. I really like the idea of having the pictures done beforehand and not having to make guests wait around after the ceremony, but I also feel like it will take a whole lot of pressure off! these are just gorgeous pictures! I love how the groom get a little teary eyed on their wedding day. I have always been against any pictures together before the ceremony....until I got engaged. It was like I immediately decided we were going to do first look pics. I read an article that a photographer wrote that changed my mind. I think the biggest reason I want to do first looks is so we can have that emotional moment just to ourselves. Have you decided what you are doing yet?? LOVE this! Chris and I will be doing a first look! I agree for time alone these are SO GREAT! I've shot two weddings where all of those portraits are smashed into this tiny amount of time before the reception, and you miss out on a really great photo opportunity. We did the extreme of a first look ourselves. We got dressed up and took the photos a few days beforehand. No can tell in terms of the photos, we got to bring the dogs, and it was a much nicer day for photos than our actual wedding day! Love your blog girl!! These photos are amazing!